Thank you to the Cranberry Marketing Committee (via the Healthy Aperture Blogger Network) for sponsoring this recipe for gluten free Savory Cranberry Stuffed Acorn Squash! In addition to being a delicious and nutritious addition to Thanksgiving or Friendsgiving celebrations, it also makes a great fall/winter side dish or entrée. Can you guys believe Thanksgiving is in a few short weeks?! 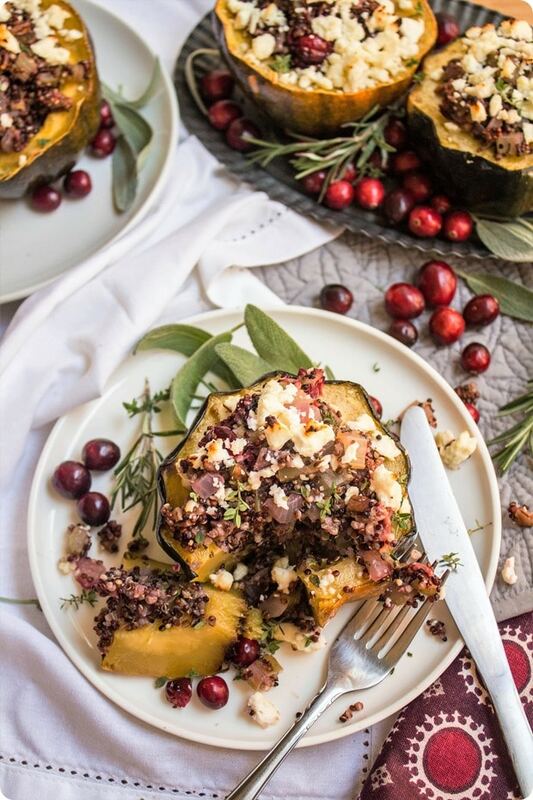 If you’re starting to plan your menus and looking for a fun alternative to the usual stuffing, give this savory and gluten free cranberry stuffed acorn squash a try! Cranberries are harvested just in time for the holidays, making it the perfect time to incorporate the yummy red berries into your recipes. 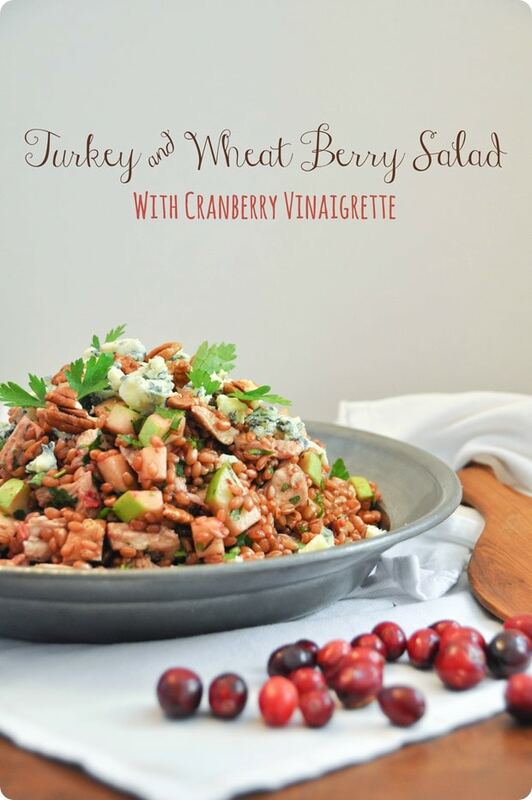 I love cranberries not only because they are so nutritious (one serving is a good source of Vitamin C and fiber, and provides antioxidant polyphenols), but also because they are so versatile – they go well in both sweet and savory dishes. We all know and love the usual cranberry sauce (check out my easy homemade cranberry sauce recipe), but let’s mix it up a bit, shall we? For today’s adventure, we’re going more savory with a combination of tart cranberries, earthy herbs, nutty pecans, salty feta, and sweet squash. 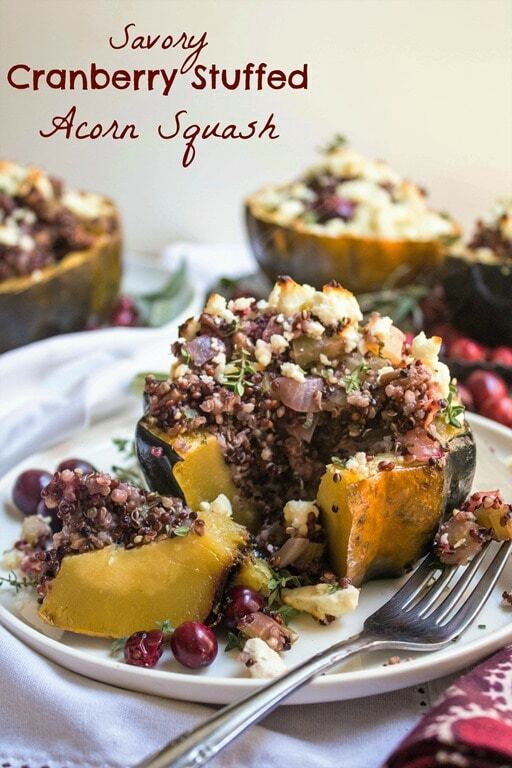 If you haven’t tried making a stuffed acorn squash before, it’s time to do it – it looks really fun and fancy for guests but it’s easy to make – total win! 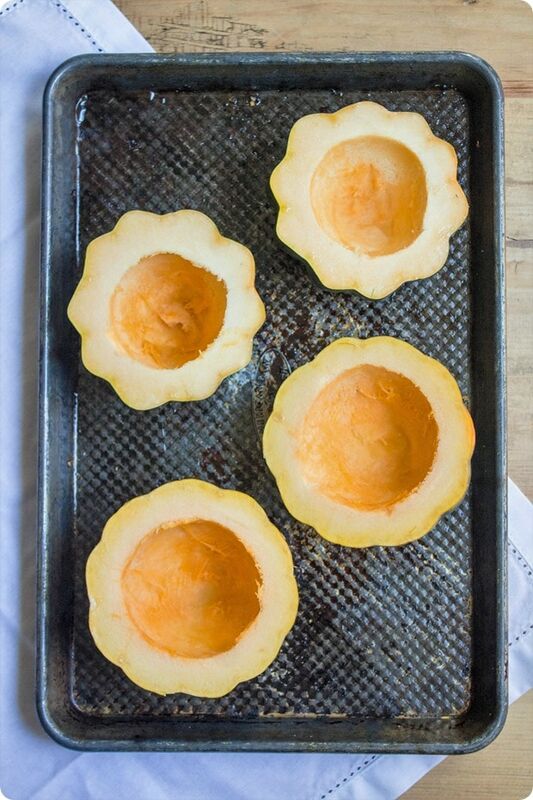 The first step is to pre-bake your acorn squash – cut it in half, scoop out the seeds, drizzle with a little oil, and bake for 25 minutes at 400 degrees F.
While the squash is baking, prep your filling! 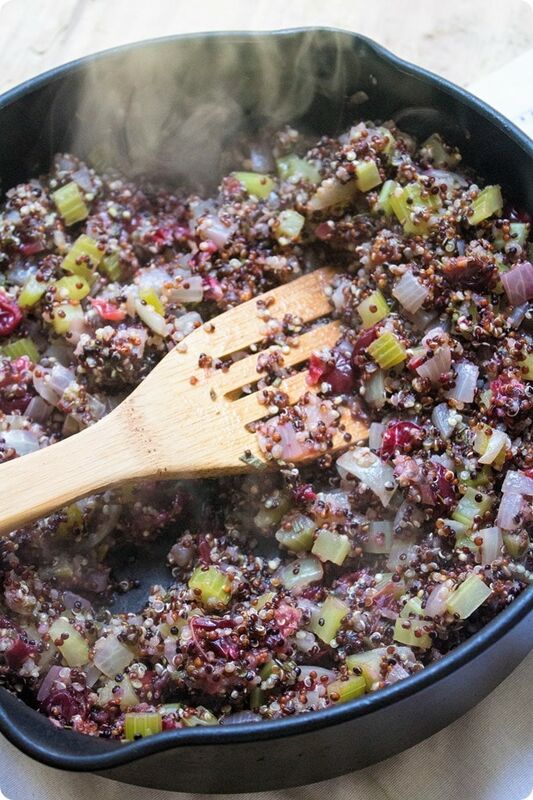 Heat a little oil in a pot or pan with a fitted lid and add your onion and celery; saute for about 5 minutes or until tender, then add the quinoa, cranberries, herbs, and vegetable broth. Bring to a boil over high heat and then cover and let simmer about 15 to 20 minutes, or until the quinoa is cooked through and has absorbed all the liquid. Stir in the pecans, and then the mixture is ready to be spooned into your cooked acorn squash halves! 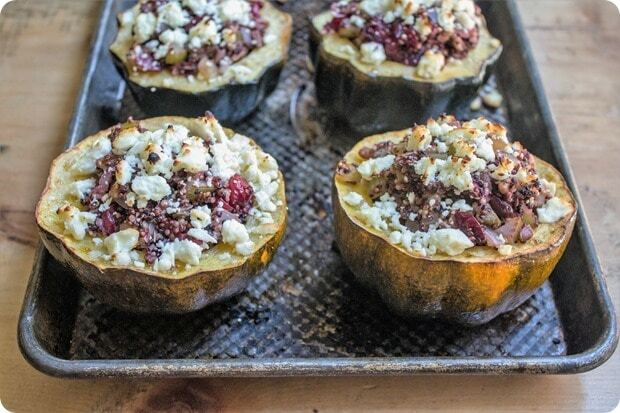 Divide evenly between the squash (you may have some extra depending how big your squash is) and then sprinkle with feta cheese. If you’re having guests over, you can pause at this step and put the acorn squash (with the filling in it) in the fridge until it’s go time – overnight if necessary. Then, the final step is to bake for another 5 to 10 minutes until the filling is heated through and the cheese is slightly browned. Let me know how you and/or your guests like it! Here’s the full recipe. Cut acorn squash in half (either lengthwise or crosswise, whichever is easiest depending on the shape of your squash; it's also helpful to cut a sliver off the bottom so the squash sits flat), and scoop out seeds with a spoon. 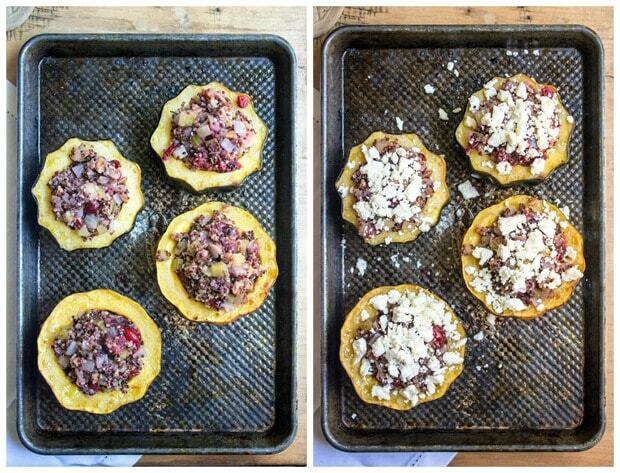 Place the squash, cut side up, on a baking sheet and drizzle lightly with olive oil. Bake for 25 minutes, until fork tender. Meanwhile, heat a drizzle of olive oil in a pot or saute pan that has a fitted lid. Add the onion and celery and saute for about 5 minutes, until just tender. 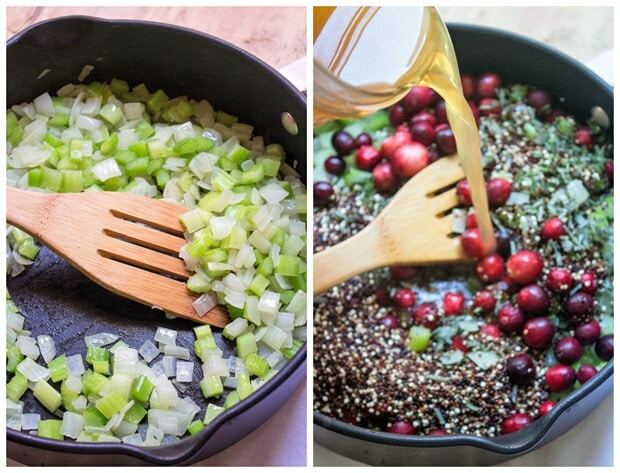 Add the quinoa, cranberries, herbs, and vegetable broth. Cover, bring to a boil over high heat, then reduce heat to low and cook until the quinoa is cooked through and has absorbed all the liquid - 15-20 minutes. Stir in the pecans. 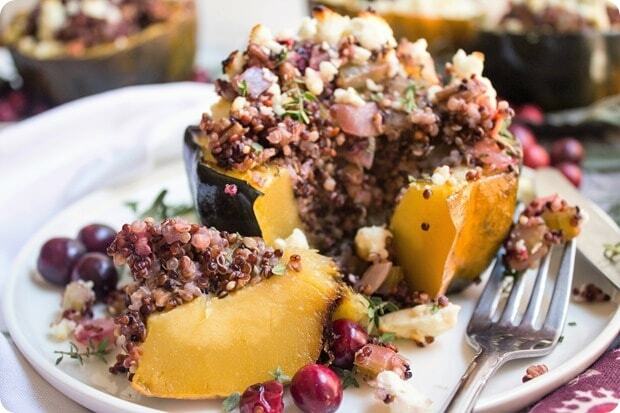 Spoon the quinoa mixture into the center of the squash halves (you might have extra, depending on the size of your squash) and sprinkle with feta cheese. Bake for another 5-10 minutes, until the cheese is slightly browned and everything is heated through. Holy cow these look amazing! I made some chorizo stuffed squash the other day and loved that, for some reason, I always tend toward savory acorn squash recipes. This looks like a delicious combination of savory and tart! 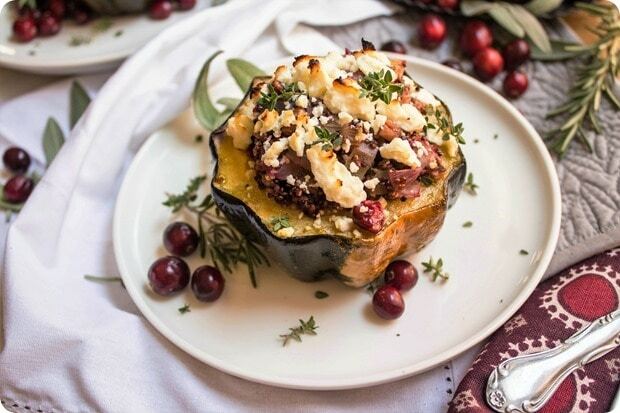 Chorizo stuffed squash sounds awesome!! I’ve made a couple variations of stuffed acorn squash lately and it’s one of my new favorite things. They’re elegant, but fun (who doesn’t love an edible bowl?) and the sweet squash goes with all sorts of flavors! I love that yours is a take on actual stuffing! 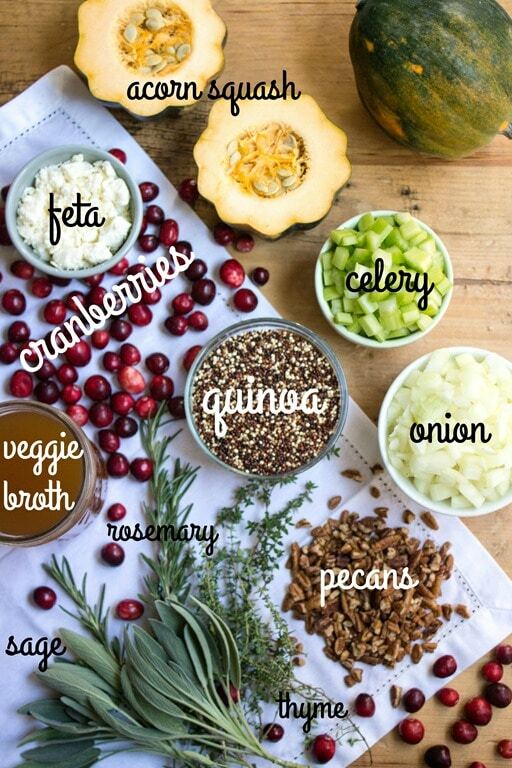 That looks perfect for Thanksgiving, so festive and so beautiful! I love stuffing squash, I’ve done butternut a few times but it’s time to do an acorn! Gotta do this one! Thanks! I did not care for this recipe. The filling was okay, but the squash itself was very bland even though I salted and peppered it before roasting. The acorn squash I used was rather large, so maybe the ratio of squash to filling was off. I would not make this again. I’m sorry to hear that! I’d guess it was probably the squash/filling ratio – but either way, I’m sorry it wasn’t a hit! Hi Anne – do you think this could be reheated via slow cooker as a vegetarian option for a Thanksgiving potluck? Thanks! Hmmm… I’m not 100% sure but I bet that would work instead of steps 6 and 7?